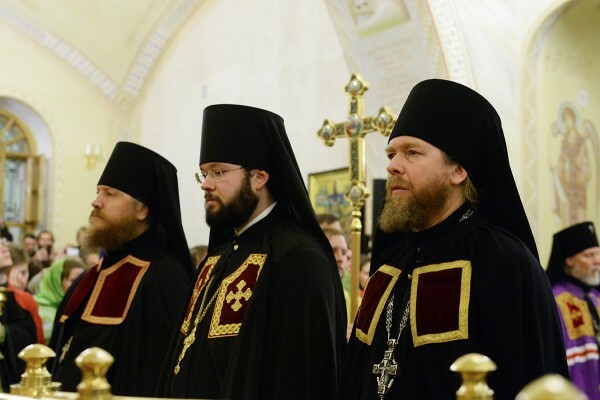 On October 23, 2015, after All-Night Vigil celebrated on the eve of the Synaxis of the Optina Starets, His Holiness Patriarch Kirill of Moscow and All Russia led the congregation in nominating Archimandrite Tikhon (Shevkunov) to be bishop of Yegoryevsk, Patriarchal Vicar, and Archimandrite Anthony (Sevryuk) to be bishop of Bogorodsk, Patriarchal vicar, at the church of the Most Holy Mother of God of the Optina Hermitage’s Monastery of the Presentation of Our Lady to the Temple. The rite of the nomination took place in accordance with the Holy Synod decision of October 22, 2015 (Proceedings 62, 63). His Holiness was assisted by Metropolitan Hilarion of Volokolamsk, head of the Moscow Patriarchate department for external church relations (DECR), Metropolitan Clement of Kaluga and Borovsk, chairman of the ROC Publishing Board; Archbishop Maximilian of Pesochnya and Yukhnov; Archbishop Feognost of Sergiev Posad, head of the synodal department for monasteries and monatiscs; Bishop Sergiy of Solnechnogorsk, director of the Moscow Patriarchate administrative secretariat, and Bishop Nikita of Kozelsk and Lyudinovo. The archimandrites elected for hierarchal ministry made to Patriarch Kirill and his concelebrants nomination vows.